My Grandma received this Hallmark or Hall Brothers card for Mother's Day from my Grandpa, my dad and my uncle. Do you think this card cost a quarter? That would have been a lot of money in 1948! 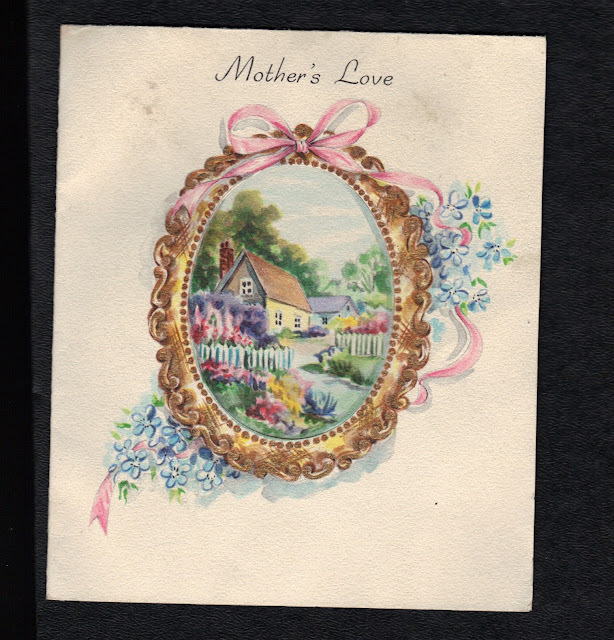 Carlene, How wonderful that this card was saved all these years. Beautiful! What a priceless heirloom. Yup, I'd say grandpa was no cheap skate. 25Cents was quite a bit for a card I would say. I love the little framed cottage. How sweet that she saved her card all those years! You'll have to do some research to see if that really was the price. It does seem like a lot of meoney for a card in 1948. I love old cards. The sentiments are so sweet and illustrations are always lovely. Thanks for linking up to Share the Love Wednesday!